AT&T said it will deploy two mobile cell sites and extra wi-fi equipment at the San Diego Convention Center and in the Gaslamp Quarter to manage the increase in demand for wireless service during Comic-Con. The mobile equipment is called a “Super” COLT— cell on light truck — and a “Super” COW — cell on wheels. One will be located behind the convention center, and the other in the Gaslamp. “Events like Comic-Con International generate memorable experiences that our customers will want to share with friends and family through text messages, photos, status updates on social networks and calls from their mobile devices,” said Tammi Terrell, vice president and general manager, AT&T Southwest and Hawaii. 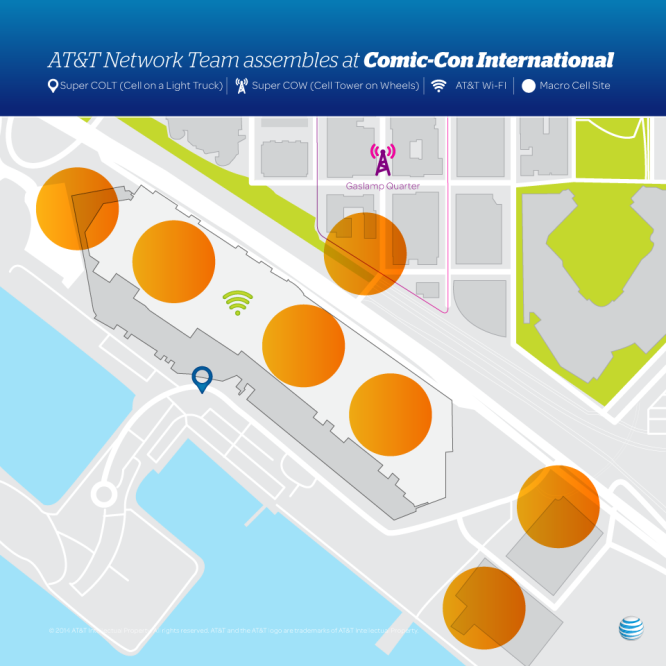 With crowds expected to reach up to 130,000, AT&T said its network team also enhanced multiple nearby cell sites, both inside and near the convention center, to ensure the best possible mobile experience during Comic-Con. In addition to the extra cell sites, AT&T said it has increased network capacities at the convention center and in the surrounding areas including the Gaslamp Quarter by 140 percent compared to 2013.